Gaza, ALRAY - Million-detention case recorded against Palestinians since Israeli occupation of Palestine in 1984, 1928 detention case recorded since the beginning of 2018, 369 of them are children and 36 are women, Prisoner Club reported. The club explained in a report on the day of Palestinian Detainees that the Israeli occupation authorities detained 6500 Palestinians , 350 of them are children , 62 of them are women 21 of them are mothers, eight of them are minor girls, among the detainees are six of the Palestinian Legislative Council members. The report noted that 48 detainees served more than 20 years in Israeli detention , 25 of them served a quarter century in Israeli detention , while 12 detainees served 30 years in Israeli detention. 12 Palestinian detainees were detained before Oslo accord which signed in 1994, and Israel refused to release them as apart of peace negotiations. The dean detainees Kareem and Maher Youns are detained since 35 years, as well as the ex-detainee Nael al-Bargoutee who served 34 years in Israeli detention before being released in Shaleet swap and has been re- arrested in 2014 ; Israeli occupation authorities re-sentenced him to his previous sentence before being released, a life imprisonment and 18 years. According to the report 500 Palestinians are under administrative detention , among them three women detainees , two minors, and four of Palestinian Legislative council members. 700 Palestinian detainees suffer of chronic diseases and need urgent medical treatment, 26 of them are cancer patients. 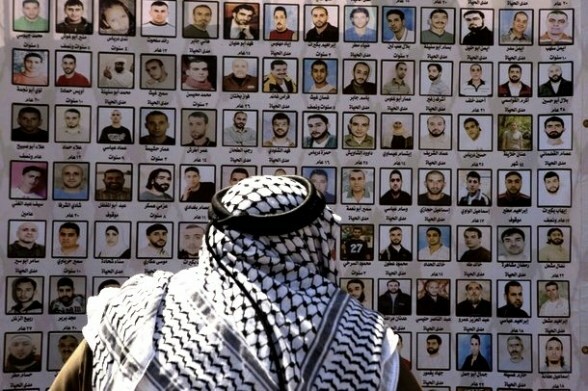 he report also recorded that the number of Palestinian detainees who dead in Israeli detentions ups to 215 in 2018. 75 of the martyr detainees killed directly after being arrested, 72 killed under torture, 61 killed of medical negligence, seven shot dead inside detention centers.